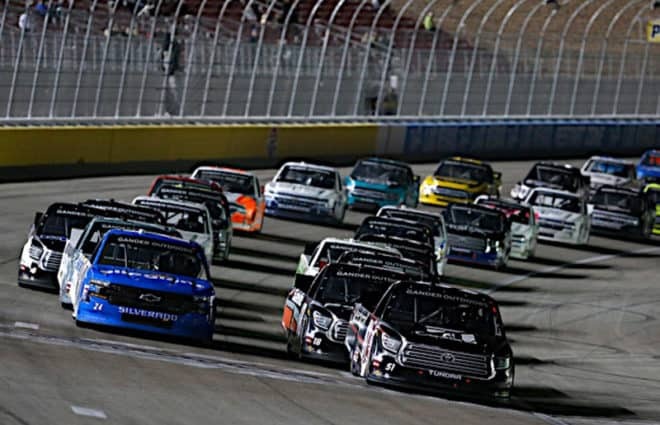 NASCAR released the 2020 Gander Outdoors Truck Series schedule on Wednesday afternoon (April 3). The series still features 23 races and will open the season at Daytona International Speedway as part of the usual tripleheader with the NASCAR Xfinity and Monster Energy NASCAR Cup series. And just like the Cup Series, the season finale has been moved from Homestead-Miami Speedway to ISM Raceway, while Homestead moves to late March. Though very few of the changes were a huge surprise given the Cup Series schedule released last week, one thing that does stand out is the addition of Richmond Raceway. It will be the first time series has raced at the 0.75-mile track since 2005. The Truck Series first visited Richmond in its inaugural season where Terry Labonte and Geoffrey Bodine put up an incredible side-by-side finish with Labonte taking the victory by a nose. The Truck Series continued to race at Richmond through the 2005 season until it was replaced by Talladega Superspeedway on the 2006 schedule. The downside of the change for 2020 is that Martinsville Speedway lost one of its two dates to open up a spot for Richmond. The good news, though, is that the playoff race at The Paperclip remains. Eldora Speedway fans, don’t worry because the series will, thankfully, continue its mid-week summer visit to the dirt track. Only instead of being a lead into the Indianapolis Motor Speedway weekend, it will run while the Cup Series takes a couple of weeks off for the Olympics. Meanwhile, this extended off period we’re at the beginning of right now — you know, the one that extends throughout the entire month of April? It’s gone next season. The longest break in the schedule for 2020 is a three-week hiatus as the playoffs wind toward a close. Michigan International Speedway will now be the final race of the regular season, while Gateway Motorsports Park opens up the playoffs. Hooray! Additionally, each round of the playoffs ends with short tracks in Bristol Motor Speedway and Martinsville, both of which should put on helluva races to set the next round. There are plenty of things that you could complain about with this schedule. After all, the number of races continues to sit at 23, when not that long ago, drivers would contest 25 events. But the addition of Richmond once again is exciting, even though it comes with the loss of one of the Martinsville dates. While I’m not a fan of removing a short track for a short track race, the good news is that The Paperclip still remains on the schedule. It remains to be seen whether ISM Raceway can put on the kind of race that the season finale is worthy of, but it’s a hopeful sign that NASCAR is making these adjustments. Perhaps, it means the sanctioning body will be open for more of a return to the series’ roots in the coming years. Only time will tell. Harrison Burton will join Joe Gibbs Racing to run eight Xfinity Series events, starting this weekend at Bristol Motor Speedway. The announcement, teased for more than a week, came on Monday (April 1) during a Facebook Live on the team’s Facebook page. Austin Wayne Self has been suspended indefinitely for violating NASCAR’s substance abuse policy. The results of random testing done at Daytona International Speedway were revealed on Tuesday (April 2). Bubba Wallace had piloted the No. 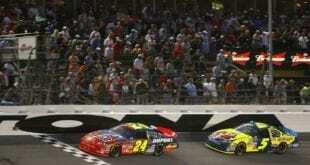 22 Chevrolet in the last two races at Texas Motor Speedway and Martinsville Speedway. Details about a driver for upcoming races will be revealed in the coming weeks. Next 2-Headed Monster: Is Jimmie Johnson Back? Not thrilled about Martinsville losing a race while Vegas and Texas both keep 2 events (Texas is especially perplexing, as those events are just a few weeks apart). IMO, they should have axed the second Texas race and go back to Indianapolis Raceway Park. The second Vegas race should be axed and given to Kansas, and the Kansas date should be given to Martinsville.